P.Mean: Running JAGS from R, a simple example (created 2013-09-04). I was bemoaning the problems with BUGS yesterday, so today I investigated using JAGS instead. This is a stand-alone program, like BUGS, and also like BUGS it has an interface within R. I want to run from inside R so I can compare different models and run a few simple simulations. The first step, like the first step with BUGS was to run a simple beta-binomial model. This model is trivial, and does not need BUGS or JAGS or any other fancy package. It is just a quick way to test things. I've run both WinBUGS and OpenBUGS and JAGS before, and I am leaning towards JAGS more these days. There has been no new developments in WinBUGS since 2008. Even the development for OpenBUGS is slowing down, it seems. Also, OpenBUGS is written in Conceptual Pascal, which may limit its portability. JAGS is written in C++, and its error messages are a bit less cryptic than either BUGS program. Also, the R interface to JAGS, rjags, is available in CRAN rather than shunted aside to CRANextras. I'm going to keep my options open, of course, but for the short term, JAGS looks like a pretty good choice. By the way, all of these programs are open source, so I have to tip my hat to those programmers who have labored to create them. Here is the model statement for JAGS. It needs to be stored in as a text file. I stored it under the name jags.beta.binomial.txt. I used the upper case MODEL in BUGS, but it looks like you need lowercase in JAGS. Let's take this apart step by step. This loads the user contributed package rjags. The data needs to be stored in a list. It gets a bit messier for more complex examples. 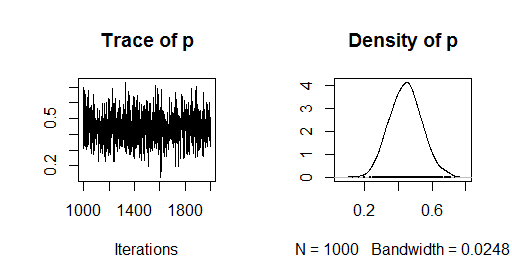 The variables a and b represent parameters for the beta prior. It corresponds to a uniform prior. The variable x represents the number of success out of n total trials. You have to tell JAGS where to find the model and the data. It produces the following output. Next you run a "burn-in" period. This is probably excessive in an example as simple as this, but it is normally a good idea to let the model run a thousand times or sometimes even ten thousand times before you evaluate any statistics. This allows the Markov Chain Monte Carlo to converge properly. Insuring convergence is actually one of the very tricky parts of these Bayesian models. As this function runs, there is a counter that notes your progress. It is instantaneous for this example, but for larger examples, you need this to tell if you need to take a coffee break or a lunch break. This creates the output that you want to evaluate. If you print the output from coda.samples, you will see that it is a list (the [] below tells you it is a list). The length of the list is the number of chains. In our case, the number of chains is 1. Each element of the list is a object of class mcmc.list. The individual items of the list are objects of class mcmc, and to explore them in detail, you need to use the attributes function. This object includes a matrix. The number of columns of this matrix is the number of nodes you are monitoring. The number of rows of this matrix is the number of iterations. The mcmc object also includes information about the beginning and end iteration numbers and the amount of thinning. In our example, the number of iterations started at 1001 (because we had a burn-in period of 1,000 samples first) and ends at 2000. The thinning parameter equals 1 because we did not request any thinning. The "matrix" here has only one column because we are only monitoring the node for p. The matrix has names for the columns, but not for the rows. There are special summary and plot functions for objects of class mcmc. The left plot looks like white noise which is some level of reassurance that the chain has converged on the true solution. There is actually much more that you should do if you are worried about convergence, but that's a topic for a different web page. The right plot shows the estimated posterior density, which looks remarkably like a beta distribution. This example just scratches the surface of what you can and should do, but it helped me get started, and if you are wrestling with R and JAGS, I hope it helps you as well.